In the early 1990s a couple of students discovered a small, enigmatic Russian camera, the Lomo Kompakt Automat, and created a new style of artistic experimental photography with their first unorthodox snapshot cavortings. In the early 1990s a couple of students discovered a small, enigmatic Russian camera, the Lomo Kompakt Automat, and created a new style of artistic experimental photography with their first unorthodox snapshot cavortings. The approach: taking as many photographs (Lomographs) as possible in the most impossible of situations possible and from the most unusual positions possible, and then having them developed as cheaply as possible. The result is a flood of authentic, colourful, crazy, off-the-wall, unfamiliar and often brilliant snapshots. These are mounted on panels to form a sea of thousands of Lomographs which regularly astonish viewers with their sheer colourfulness, diversity and power of expression. Ensuing major exhibitions in Moscow, New York, Vienna, Berlin, St. Petersburg, Havana, Zurich, Cologne, Madrid, Cairo, Tokyo and many other cities, where up to 100,000 Lomographs were shown at a time, established an international reputation for Lomography. So, what started out spontaneously as an artistic approach to photography in the Vienna underground scene developed into a far-reaching, international socio-cultural movement. This development has been supported by the marketing of products that have since been 'discovered' or specially developed by the Lomographic Society: extraordinary snapshot cameras (for example, the 4-lensed cameras or the Holga), photoFashion, photographic accessories, Lomographic books etc.. Also by a diversity of cultural activities organised regularly by the Lomographic Society in 35 countries around the world. The specially inaugurated LomographicAmbassadors look after LomographicFriends on a regional basis and organise all sorts of activities, such as exhibitions, parties, shows, LomographicShootings and tours, publications, international and local art projects, also collaborating on projects in the areas of film, music and the new media, as well as providing local support in a series of annual world-wide events and competitions. The social and visual credo of Lomography had a strong influence on the function and aesthetic of photography in the 1990s. Today the community of Lomographers has over 500,000 members world-wide. Among these are mere mortals like you or me, but also such famous individuals as Brian Eno, Laurie Anderson, David Byrne, Pulp, Underworld, Helmut Lang, Moby and Robert Redford, to name just a few. The basic Lomographic idea be fast, don't think, be open-minded towards your environment, absorb everything, collect and enjoy being communicative has spread into a culture of communication and an approach to awareness that is shared throughout the Lomographic network. The creative premise is based on the playful combination of lo-tech and hi-tech and the amalgamation of a cultural institution with a commercial photographic and design company. 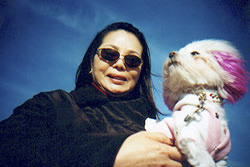 And this approach has provided the Lomographic movement with a most exquisite role in this age of global and borderless (tele)communications wherever language, text and images are involved. Where is all this going? The Lomographic Society is busy beavering away with hundreds of thousands, soon to be millions of Lomographers, on and on, on the perpetually ongoing LomographicSysiphus project: The LomoWorldArchive. This is the most comprehensive archive of snapshots of all time, with all really all the wackiest and most impossible sights and moments of our time! Where is this archive? In Lomographers' shoe-boxes, stacked on chairs, tables, in cupboards, drawers, and on the ceilings, floors and walls of Lomographic homes, in LomographicAlbums, at the Lomographic Society International Central Office in Vienna... and in the highest, most select quality and concentration, online in the LomoWorldArchive at the global communications centre of Lomography: www.lomography.com In fact: The archive is growing and growing and growing on a daily basis, hourly, by the minute! All Lomography cameras use standard 35mm rolls of film and can be processed normally at any photo laboratory. 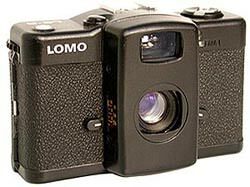 The legendary Lomo is a small, robust, high-precision, fully automatic snapshot-taking camera from St. Petersburg with a truly incredible lens. The Lomography movement began with the discovery of this little technical gem, and as ever it is still at the heart of the world of Lomography. The maximum production of 3,000 hand-assembled pieces per month is hardly enough to satisfy world-wide demand. So to make the distribution fairer, the Lomographic Society spreads the available Lomos around all the countries that have LomographicEmbassies (30% USA, 35% Europe, 35% Asia). What's so special about the Lomo Kompakt Automat? The Lomo Automatic Exposure: 100% reliable during the daytime, however its true character comes to the fore in difficult light conditions or in the depths of the night long exposures of up to 60 seconds! Perfect for stunning, totally atmospheric night shots without a flash! The Lomo Lens: The result of top secret Russian glass-making techniques it makes colours glow and creates psychedelic effects. Buy this camera. New: Lomo LC-Wide - developed with a new 17mm ultra wide angle lens, read our review here. One shot four panorama exposures in a series on one photographic print, quick-rewind rip-cord, in yellow or pearl. The SuperSampler combines the basic idea of the ActionSampler camera (4 lenses used in series) with high-precision European engineering know-how, optimum Japanese-Chinese lens quality and Lomographic design. Without a viewfinder with the patented rip-cord to wind on the film! Four light-sensitive, high-precision panorama lenses are arranged on the camera so close to one another and so compactly that they can expose four panorama shots in series on one negative, i.e. on each print: either vertical with one above the other or horizontal with one next to the other. Whether shots are of people, animals, architecture or nature, depending on the action involved and the movement, the results show an endless diversity in a whole new kind of serial image! The idea, concept and design are all by the Lomographic Society. At the New York Gift Show, this little beauty walked home with the prize for 'Best Design Product of the Show'. The classic Chinese 4-lens camera in transparent, milk or chrome, it comes in a box or in a blister-pack. The ActionSampler and the CyberSampler are identical cameras and only differ in colour and packaging. Whereas the SuperSampler has its lenses arranged in a vertical row, these two cameras have their lenses arranged in a square. When the exposure release button is pressed four images are exposed going clockwise on the negative, each a quarter of a second after the next. The Action- and CyberSampler are ideal for use right in the thick of the action. The Lomo PLC factory goes into production with the Lomo Kompakt Automat using Prof. Radionov's famous lens. Matthias Fiegl and Wolfgang Stranzinger, two Viennese students, discover the Lomo Kompakt Automat and found theLomographic Society International. Today the community of Lomographers has over 500,000 members. The first international LomoExhibition is held in Moscow and New York simultaneously. 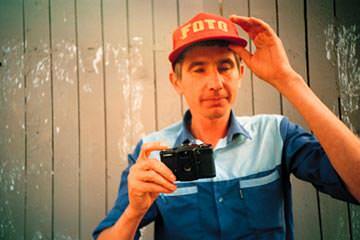 Starting in Berlin, LomographicEmbassies spread around the whole world. There are currently approx. 60 embassies on all of the continents. The Society organises LomographicTours, expeditions to various destinations. The two founders of the Society negotiate with Mr Vladimir Putin to guarantee the continued production of the Lomo Kompakt Automat, and sign a contract for the world-wide distribution rights with Lomo PLC. 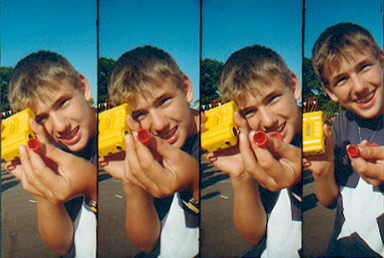 Lomography goes online. The continuous development of new features at www.lomography.com facilitates innovative projects and interactive communication within the Lomographic community. The society presents the first lomo film project Lomo TV. The first LomoWorldCongress is held in Madrid in 1997; the second LomoWorldCongress is held at the Cologne Photokina in 1998. The first ActionSampler WorldChampionships in 1999; the Lomolympics 2000; the LomographicSamplingGames 2001. 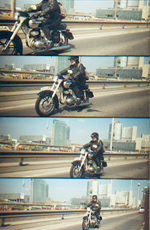 At the Photokina the Lomographic Society International introduces a new camera: the ActionSampler. An incredible, 4-lensed, photo-photo-photo-photo-camera that dissects a second into four parts and then puts them back together to create something totally new. In October of the same year the Lomographic community meets at the new Embassy in New York for the 2 week MarathonEvent with the aim of finding the ActionSamplerWorldChampion. At the Salone Del Mobile the Lomographic Society International presents the first camera to have been developed, designed and patented exclusively by a team of Lomographers: the SuperSampler. The queen of multi-lens cameras. In April the first Lomo Gallery opens in London. In the wake of many in-house publications (Moscow New York 1995, Lomo On 1997, The Big Lomo 1997, Ferrari Lomo Project 98, LomoViennaGuide 1999) the Lomo-Mauritius image catalogue is released in co-operation with the German image agency Mauritius. 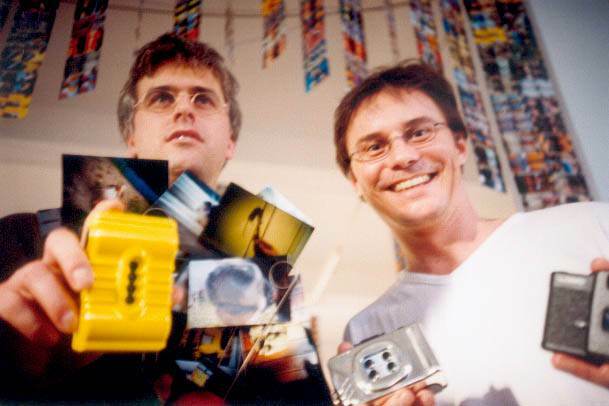 In summer 2001, on the opening of the new Vienna MuseumsQuartier, the Lomographic Society opens the very first Lomography Shop in the world. The excessive range of products on offer and the design of the shop provide the contents of the culturequarter with a whole new facet. The autumn of the same year heralds the launch of the new Lomographic FashionLine: Only Naked Is Better. I worked in a photographic shop when the Lomo Kompakt Automat first appeared in the UK. At the time, like all Russian equipment, it was heavily subsidised by the USSR and had a retail price of just 30. For comparison at the same time a Zenit manual SLR and a black & white enlarger used to sell for the same price. The camera had a lens that provided images with exceptional quality at the centre of the picture, but suffered from vignetting, making the corners much darker. This is still the case, but one of the appeals is photographs have a unique quality and this is why so many photographers and celebrities are now using this camera. The camera was also very unreliable (the shutter used to stick open either caused by poor mechanics or bad battery contacts), but so was most Russian gear. I used to warn customers that if they got a good one they had a superb piece of kit, but they had to be prepared to have to take one or two back to end up with a reliable one. As customers bought the camera, took pictures and inspected the results, they talked about quality and we had a waiting list of photographers wanted to get their hands on the short supply camera. And then, like most Russian gear, production ceased and we saw no more of the camera. Now thanks to the guys in Vienna the Lomo is talked about all over the world and, as youve read in this article, used by some very influential people. The cameras are also hand built so I guess the reliability issue is no longer a question. If you were around when the camera first surfaced, you may, like me, feel 120 including shipping, seems expensive for a camera that used to sell for 30, especially if you consider what cameras you could pick up for the same money. The thing that is appealing is the unique quality (Pinhole cameras sell for 150!) and the amount of interest on the web that makes you part of a massive enthusiastic club. You wouldnt get that with an autofocus zoom compact!